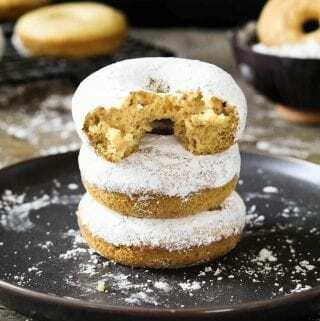 A lighter take on a classic, these Vegan Powdered Donuts are baked to golden perfection and frosted with fluffy sugary goodness. Growing up, we always had a box of Hostess powdered donuts in our kitchen. Didn’t everyone? I wasn’t allowed to freely eat them, but I could have one for dessert or when company came over. I would have them with a tall glass of milk, and the adults had coffee or tea. I have fond memories of these heavenly donuts, so I recreated a healthier vegan version. This doesn’t mean that they are good for you, but they are worlds better than the original. I still enjoy them with milk, but I choose Creamy Cashew Milk instead of dairy now. 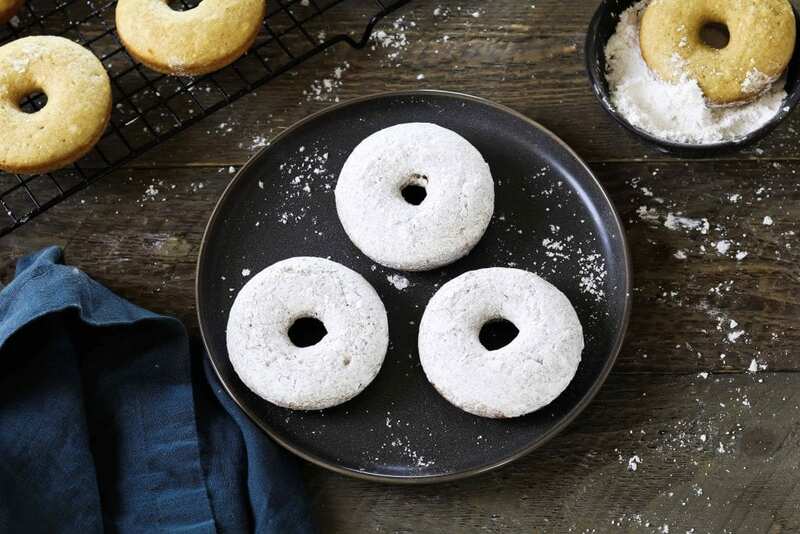 Just like the Hostess variety, my vegan powdered donuts are soft, sweet and fluffy with a rich buttery flavor. They are so easy to make and require simple kitchen staples. 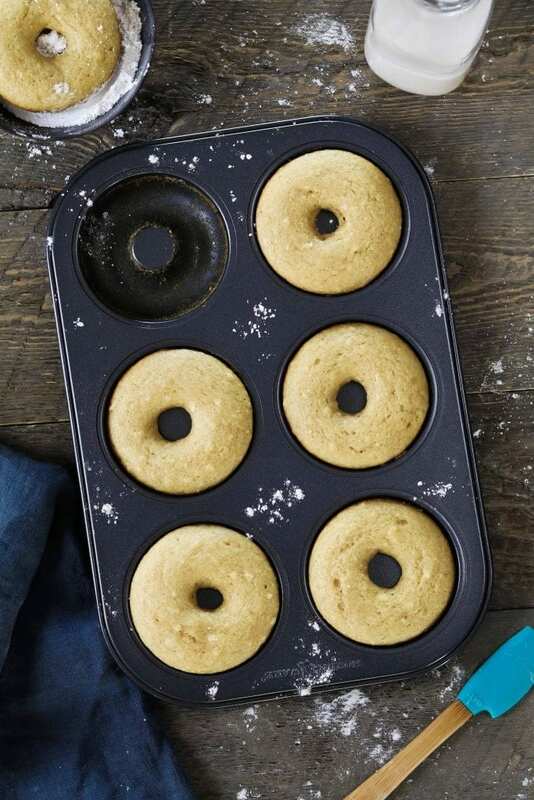 You’ll also need a set of donut pans which are pretty inexpensive and so worth the purchase. I’ve put them to good use over the years and made every type of donut under the sun (Including these Pumpkin Spice Donuts). Most mainstream stores carry them and I’ve seen them in second-hand stores too. 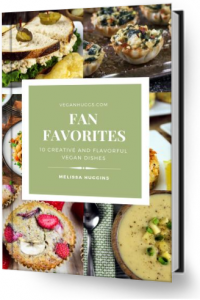 To get started, you’ll need all-purpose flour, baking powder, baking soda, ground cinnamon, salt, granulated sugar, vegan butter, vanilla extract, non-dairy milk, applesauce, and powdered sugar. Preheat your oven to 350 ° F (177 ° C). Lightly grease the slots of two donut pans and set aside. Melt the vegan butter and place it in a large mixing bowl. Now add the non-dairy milk, vanilla extract, applesauce, and granulated sugar. Whisk to combine well and set aside. Now, In a separate med-large mixing bowl, sift the flour, baking powder, baking soda, cinnamon, and salt together. Whisk to combine everything well. *Baking tips: for accurate results, don’t scoop the flour with a measuring cup directly from the flour container. Instead, scoop the flour out of your container with a spoon and then into a measuring cup. Don’t pack or tap the cup. After filling, lightly sweep a butter knife across the top to remove the excess flour. Here’s a great article on the importance of measuring properly for satisfactory results. Now, slowly start adding the flour mixture to the wet mixture and stir as you go along. 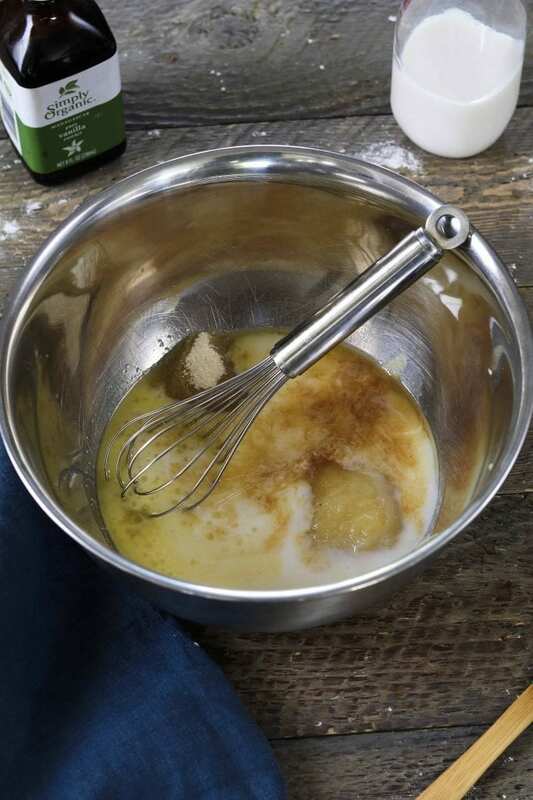 You want to mix the batter until it’s just combined. 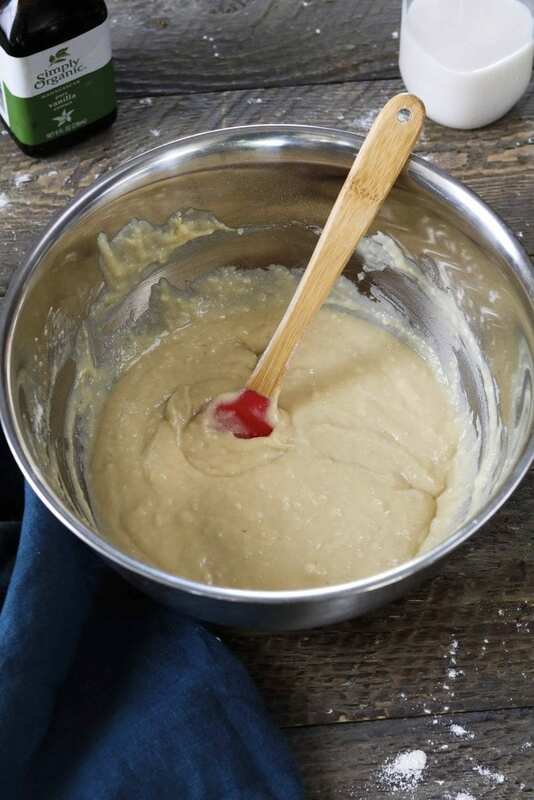 The batter doesn’t need to be completely smooth and a few lumps are fine. You don’t want to overwork the batter because it will produce a dense donut. The batter should be thick, but pourable. If it’s too dry & thick, add 1-2 teaspoons of milk and gently combine. Using a spoon add your batter to a large Ziploc or decorating bag. Twist top closed and snip off one corner leaving a 1/2 ” hole (*hold the bag upwards when cutting so the batter doesn’t leak out). 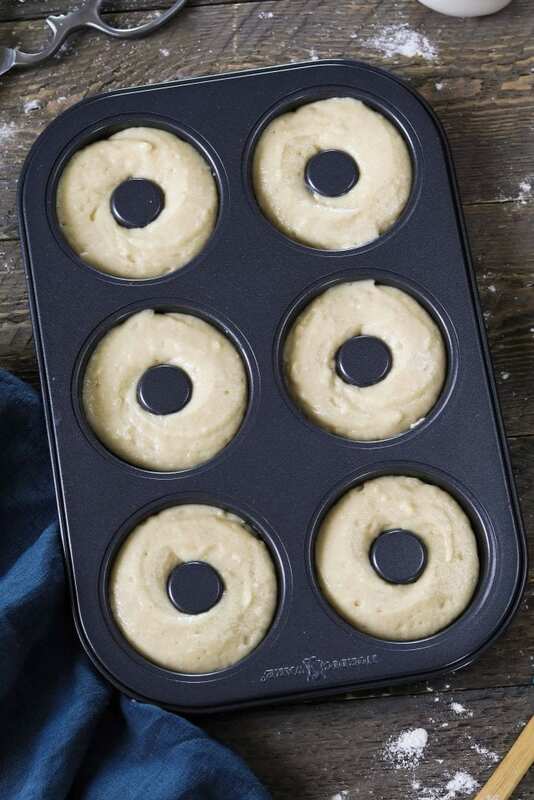 Pipe the batter into your greased donut pans. Fill about 2/3 – 3/4 of the way full. Place in the oven on the middle rack for 10-12 minutes. They cook fast so keep an eye on them. To check for doneness, lightly press the surface. It should spring back. Remove the pans from the oven and let them cool for 5 minutes before touching. Now gently remove the donuts and let them cool on a cooling rack for 10 minutes. For the powdered sugar coating, pour the sugar into a medium plate or bowl. Dip each donut in the sugar until well coated. You can coat just half or cover the whole donut. Enjoy! 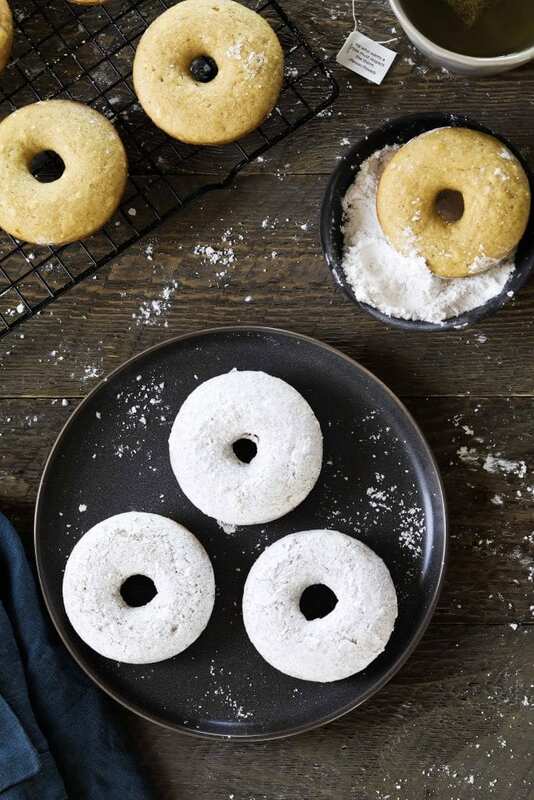 If you make these Vegan Powdered Donuts, I’d love to hear what you think in the comment section below. It would really make my day. You can also follow me on Instagram and share your creation with me. Just tag me @veganhuggs and hashtag #veganhuggs so I don’t miss it. 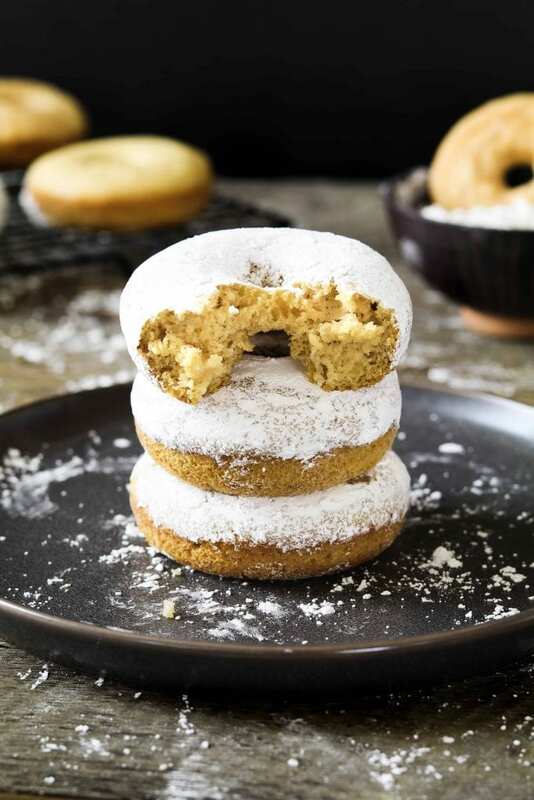 A lighter take on a classic, these Vegan Powdered Donuts are baked to a golden perfection and frosted with fluffy sugary goodness. Lightly grease the slots of two donut pans. In a large bowl, add the melted butter, non-dairy milk, vanilla extract, applesauce, and granulated sugar. Combine well. Now, In a separate med-large mixing bowl, sift the flour, baking powder, baking soda, cinnamon, and salt together. Whisk to combine well. Slowly start adding the flour mixture to the wet mixture. Stir as you go along. Mix until just combined. 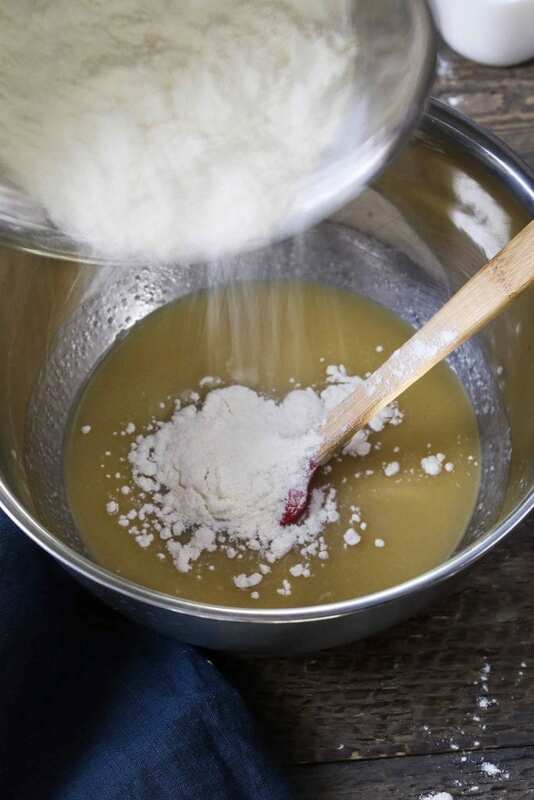 Don't overwork the batter or it will produce a dense donut (*The batter should be thick, but if it's too dry & thick to stir, add 1-2 teaspoons of milk and combine). 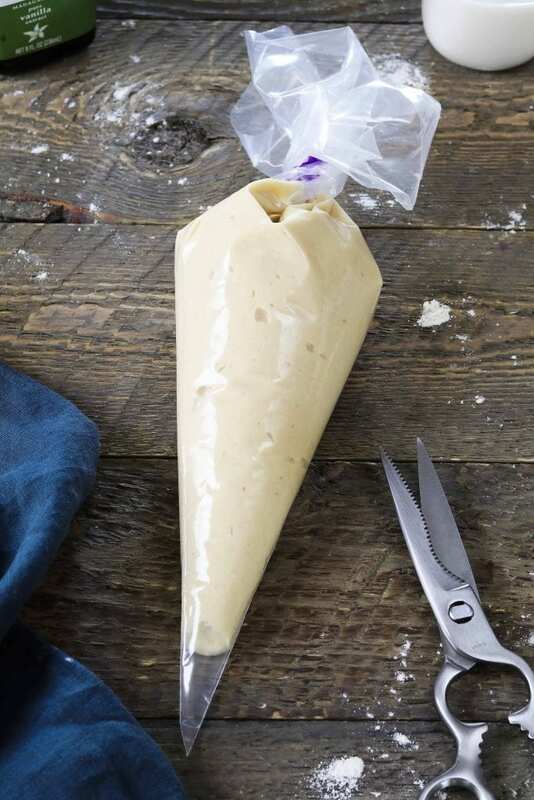 Using a spoon add your batter to a large Ziploc or decorating bag. Twist top closed and snip off one corner leaving a 1/2 " hole (*hold the bag upwards when cutting so the batter doesn't leak out). Pipe the batter into your greased donut pans. Fill about 2/3 - 3/4 of the way full. *Pour the sugar into a medium plate or bowl. Dip each donut in the sugar until well coated. You can coat just half or cover the whole donut. Enjoy! 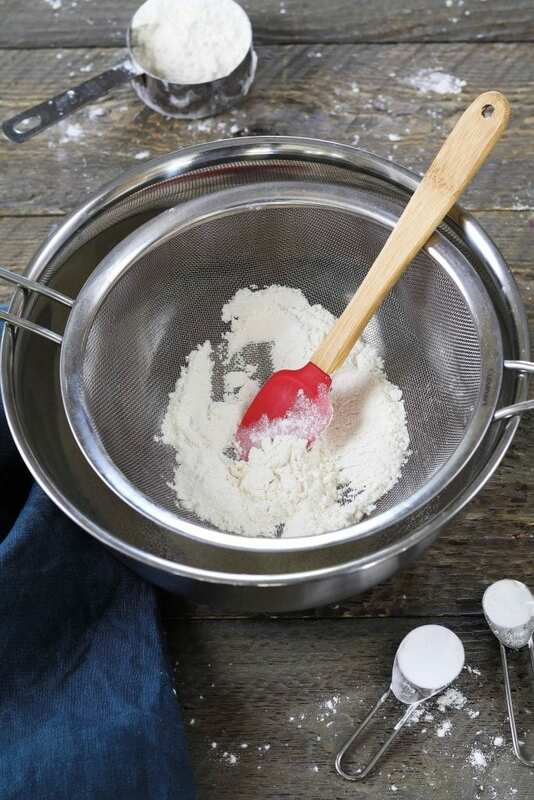 * For accurate results, don't scoop the flour with a measuring cup directly from the flour container. Instead, scoop the flour out of your container with a spoon and then into a measuring cup. Don't pack or tap the cup. After filling, lightly sweep a butter knife across the top to remove the excess flour. * Donuts are freshest the same day, but they will store in an airtight container for 2-3 days. * Nutritional Info: I calculated the info using all of the powdered sugar for the coating. However, you may not use all of it, so the calculations will be different. * Yields about 9-10 donuts. I’m new to donut-making and have been poring over recipes all morning. 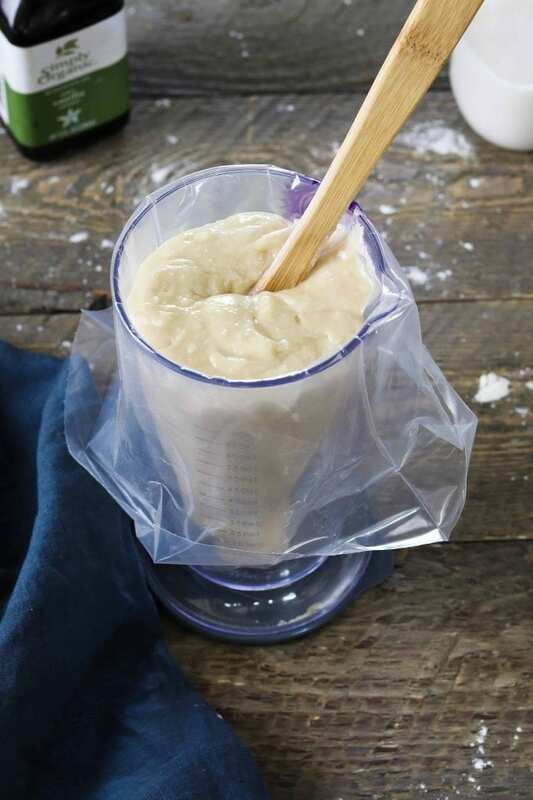 This is the only one I’ve found that calls for piping the batter into the pans using a pastry bag. Is that required, or would carefully spooning the batter into the pan work? Thanks! I made these yesterday. They turned out so fluffy and light! Thank you!! Great recipe!